TWO REUTERS JOURNALISTS who went missing in Syria have been released by the country’s authorities today. Reuters confirmed their release this afternoon. Ayat Basma, a producer, and Ezzat Baltaji, a cameraman, went missing in the capital of Damascus over the weekend as they covered the ongoing protests in Syria. Basma and Baltaji, both Lebanese, had been in Syria since Thursday covering mass protests against President Bashar al-Assad’s 11-year rule. They were due to cross the border back into Lebanon at 6.30pm on Saturday night but were last heard from at 5.22pm when they sent a phone message to a colleague in Beirut saying the they were on their way back, after which they were incommunicado. Reuters had been working with authorities in Syria to try and locate the pair. 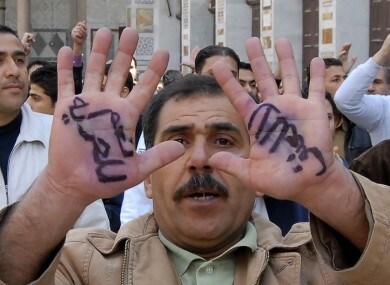 A number of journalists have been caught up in the protests across the Arab world. Four New York Times journalists went missing in Libya earlier this month before surfacing six days later, they are believed to have been detained by forces loyal to Libyan leader Muammar Gaddafi. In February, CBS news correspondent Lara Logan suffered “a brutal and sustained sexual assault” while covering the political upheaval in Egypt that eventually led to the resignation of president Hosni Mubarak. Email “Two Reuters journalists freed by Syrian authorities”. Feedback on “Two Reuters journalists freed by Syrian authorities”.